Trading Spaces a roundtable on art and architecture Art and architecture meet more often and more profoundly today than ever beforefrom public art to the art-fair tent, from the pavilion to the installation. But if the interchange between these fields offers a host of new possibilities for structure, space, and experience, it also makes reflection on their status more urgent. 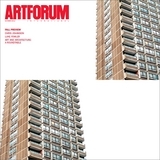 To chart this complex constellation of interactions, Artforum invited critics HAL FOSTER and SYLVIA LAVIN; artists THOMAS DEMAND, HILARY LLOYD, and DORIT MARGREITER; architects STEVEN HOLL and PHILIPPE RAHM; and curator HANS ULRICH OBRISTa group whose pioneering work marks the front lines of art-architecture exchangeto engage in a conversation moderated by Artforum senior editor Julian Rose. Philippe Rahm Architectes, Evaporated Rooms, 2011–12, Lyon, France. Apartment interior. Photo: Nicolas Pauly, 2012. JULIAN ROSE: While many agree that there is an unprecedented level of interchange between art and architecture today, there is surprisingly little consensus about what, specifically, these interactions entail or where they actually take place. Which models of interaction between art and architecture are most significant, and where can we begin to locate them? STEVEN HOLL: Architecture is an artthe premise of a division is specious. THOMAS DEMAND: I do think there is a clear difference between the practices, though. Every time I’ve ever worked with an architect, the collaboration was based on the fact that we came from separate corners, and that was precisely what made it productive.